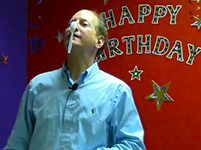 Learn Magic: How to Hang a Spoon on Your Nose! Get some laughs at the dinner table with this one! Float into the Room! Effect: Your head comes into view in the doorway, as though you are sideways—maybe even flying. (Photo #1)You go up and down the door jamb (photo #2), then jump down, landing in the doorway, and walk into the room.Talk about a dramatic entrance! A fun stunt to do for friends or family, or to make an entrance to begin a show. I use this in my show as a comic interlude. It usually gets a good laugh! I hope you’ll have fun with it. Effect: You “hypnotize” a spectator who sits in a chair holding a cup of water atop her head. When she looks in the cup, the water has disappeared, without her knowing where it went! The audience knows and thinks it’s funny! A glass of water is on the table. “I am going to go out of the room”, you explain, “and I’ll bet the water will be gone before I walk back in.” Would you take this bet? Ask someone to jot their favorite book on a slip of paper, then cover it with their hand, so you can’t peek. With a little concentration, believe it or not, you can tell them what’s on the paper! How? Dropping a Card on Edge? Complain that your neck has been hurting. Mention that you think you might have a case of Dog Jaw. Ask the person you’re showing this to if they’ve ever heard of Dog Jaw?